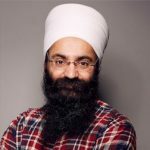 With over 13 years’ experience in Digital Marketing, and a Statistics Doctorate, Dr Karandeep Singh PhD is a specialist in digital analytics and data driven conversion optimisation. A results-oriented digital professional, he has vast experience in presenting innovative digital strategies and workshops at conferences, meetings and summits across the globe. He has worked with an impressive range of global brands, including Mercedes-Benz, The Telegraph, Specsavers, Walt Disney, Kellogg’s, Microsoft and Honda. Now, he has chosen to dedicate his life to voluntary work in India, by uplifting the local people out of poverty, drug abuse and alcohol addiction. While working towards women’s empowerment, he has decided to show Mata Sahib Kaur as the first female role model from Sikh history. To embrace modern technology, to reach out to the youth and to attract non-Sikh audiences, he knows that 3D animation is the way forward. He feels proud and honoured to be doing this (voluntary) seva of directing Motherhood: The Journey of Mata Sahib Kaur.